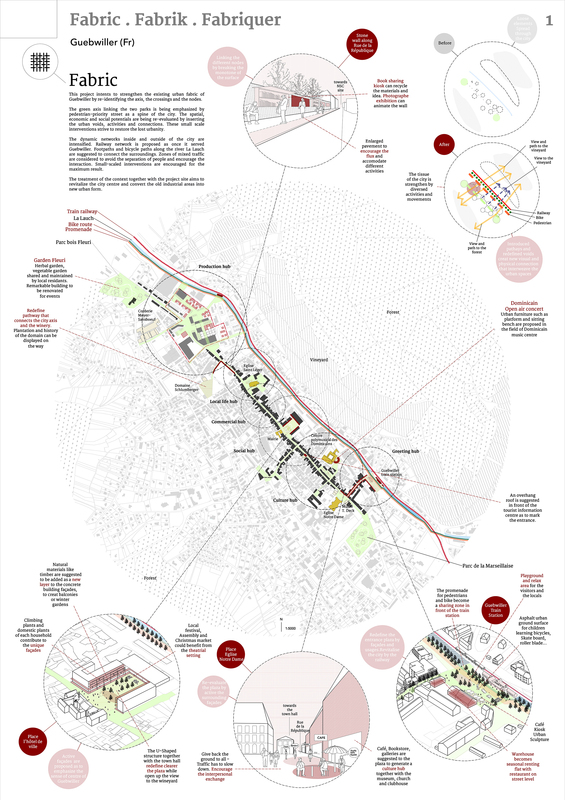 This project intents to strengthen the existing urban fabric of Guebwiller by re-identifying the axis, the crossings and the nodes. The green axis linking the two parks is being emphasized by pedestrian-priority street as a spine of the city. The spatial, economic and social potentials are being re-evaluated by inserting the urban voids, activities and connections. These small scale interventions strive to restore the lost urbanity. The dynamic networks inside and outside of the city are intensified. Railway network is proposed as once it served Guebwiller. Footpaths and bicycle paths along the river La Lauch are suggested to connect the surroundings. Zones of mixed traffic are considered to avoid the separation of people and encourage the interaction. Small-scaled interventions are encouraged for the maximum result. 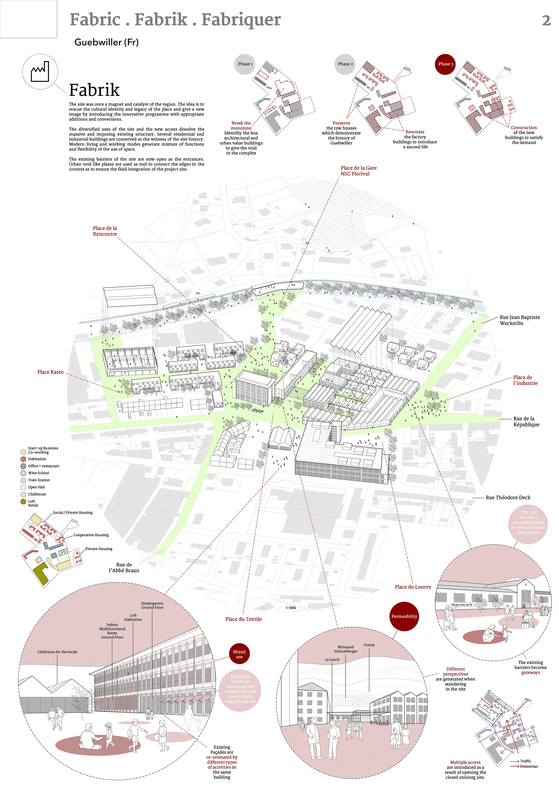 The treatment of the context together with the project site aims to revitalize the city centre and convert the old industrial areas into new urban form. The site was once a magnet and catalyst of the region. The idea is to rescue the cultural identity and legacy of the place and give a new image by introducing the innovative programme with appropriate additions and conversions. The diversified uses of the site and the new access dissolve the massive and imposing existing structure. Several residential and industrial buildings are conserved as the witness of the site history. Modern living and working modes generate mixture of functions and flexibility of the use of space. The existing barriers of the site are now open as the entrances. Urban void like plazas are used as tool to connect the edges to the context as to ensure the fluid integration of the project site. To make Guebwiller productive again by transforming the former industrial sheds into creative clusters. Beautiful volume of the existing buildings is being highlighted and revitalised by various activities. The generous space and the industrial spirit of the site can stimulate the contemporary and sustainable ideas like recycle and resemble business, co-working ideas-sharing business, resource-sharing industry. 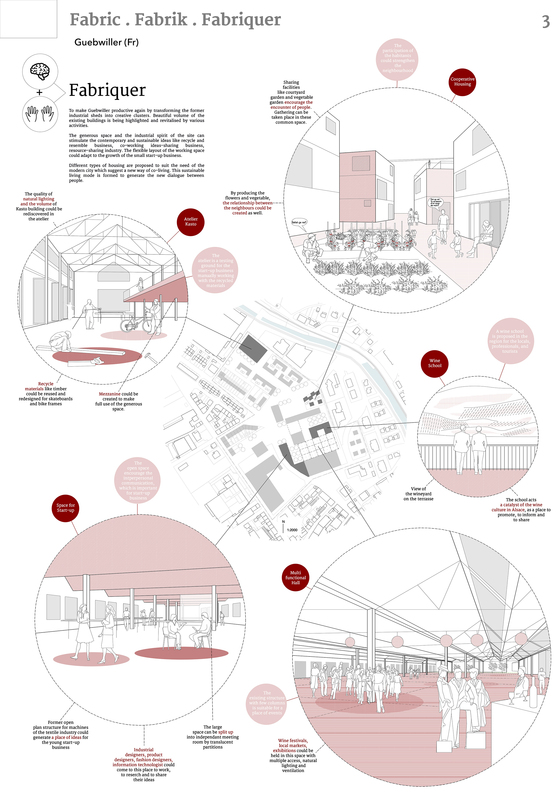 The flexible layout of the working space could adapt to the growth of the small start-up business. Different types of housing are proposed to suit the need of the modern city which suggest a new way of co-living. This sustainable living mode is formed to generate the new dialogue between people.